Other Books by the Author - De website van intelligencealgorithm! Will the internet one day awaken as a conscious entity? Or do we need to design a structured architecture in order to impart the quality of consciousness to the web? In the present book Technovedanta an architecture for the internet as AwwwareNet is proposed based on stratifications derived from the Indian philosophy of Vedanta to create a functional mimic of consciousness, quasi-consciousness. 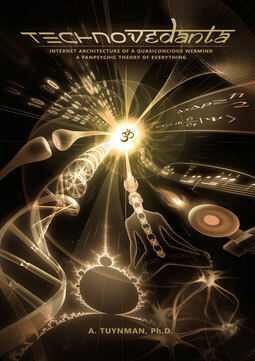 The deep exploration in Nature’s fundamental primacy of consciousness led me to the hypothesis of a panpsychic theory of everything. Welcome to a journey into the unfathomable realm of fantasy, the chaotic soup from which successful strategies are searched, pruned and concretised to fulfil the cosmosemiotic imperative of ever increasing complexity and meta-variegation. Welcome to this book of books, a modern clavicula to engender the eschatological apotheosis of Vedantic Singularity. Welcome to the unusual marriage between Technology and Vedanta. Have you ever read a book, which logically shows where logic is absurd? A book, which scientifically shows where science fails? A meta-philosophy which shows where philosophy is useless? Welcome to the book of books; the Clavicula to open the gates of Hell and Heaven to summon the forces of Mind and Matter. A quest into the deepest realm, where reality and imagination fade into each other like pictorial values. A journey into the Highest Transcendence. Everything is hereby incorporated by reference. From the primordial Sense to the scattered kaleidoscopic reverberations in the Hall of Mirrors; the octaves and scales of Ouroboric existence, the mighty worm of digital virtualisation. This is my gift to you: To free you from any belief system, to free you from the chains of your self-inflicted prison of Mind. Fear not to be left in the agnostic Limbo, even if I won't lead you to your Gods; instead I will show you the Technology, which one day will make a God of you. Meet me at the junction where Vedic and Buddhist spirituality join Science, and I will show you what lies beyond the Technological Singularity. The Transcendental Metaphysics of Pancomputational Panpsychism.